A few weeks ago we announced the names of the people who, together with us, work conscientiously to create every model in our collection. We had a chat with our Art Directors Alessandro Castello and Mari Lagravinese of Castello Lagravinese Studio about the challenges which we have faced together over the last few years. But we hadn’t finished the discussion. So this is how it continued: with the addition of Filippo Berto. BERTO: What happens when you get together to discuss a new project? What inspires you even before you go into the room with your ideas? ALESSANDRO CASTELLO: Our projects are the result of daily conversations and a continual exchange of ideas and opinions between us and Filippo so that we can create a communal project together. For this reason, when we need a new project or a new collection it is perceived in advance and shared with everyone concerned. MARI LAGRAVINESE: In general we are extremely curious about everything that surrounds us so very often the inspiration for our products comes from our everyday life, both professional and private. In many cases it’s just a tiny intuition or a small detail which attracts our attention at the most unlikely moment: a fashionable article in a shop window seen while waiting for a flight in an airport, a scene in a film, the page of a magazine or even walking through a street market. FILIPPO BERTO: That’s right. Every day we listen to requests from our customers and our aim is to satisfy them in every way. Each model presented in our showrooms, on our web site and delivered to our customers is the result of months of working on a project to create sofas which will last in time, designed right from the beginning to be personalised while still retaining style and comfort. BERTO: If you had to indicate just one word to describe the values and the passion of the work we do together, what would it be? MARI LAGRAVINESE: With Filippo we have created a sort of “laboratory of ideas” where each of us make a contribution and thanks to this we are able to create a common aim which we want to achieve. His ability to receive and react to the stimuli we provide is certainly a fundamental aspect for the advancement and success of each project. FILIPPO BERTO: Ours is a very serious game. We realise that our meetings often start with extravagant ideas, difficult to accomplish, but these are the challenges we welcome. We look beyond, always keeping this challenge in mind. This laboratory of ideas involves the entire group, the upholsterers, interior decorators and marketing. Everyone contributes and everyone shares. Sharing is also one of the 74 key words in our book Spirit of 74. BERTO: Is there a particular model in the collection which has given you the most satisfaction? MARI LAGRAVINESE: Undoubtedly the most exciting moment in the creation of a product is the first step from a bidimensional design to a three-dimensional model, the transition from paper to concrete reality. 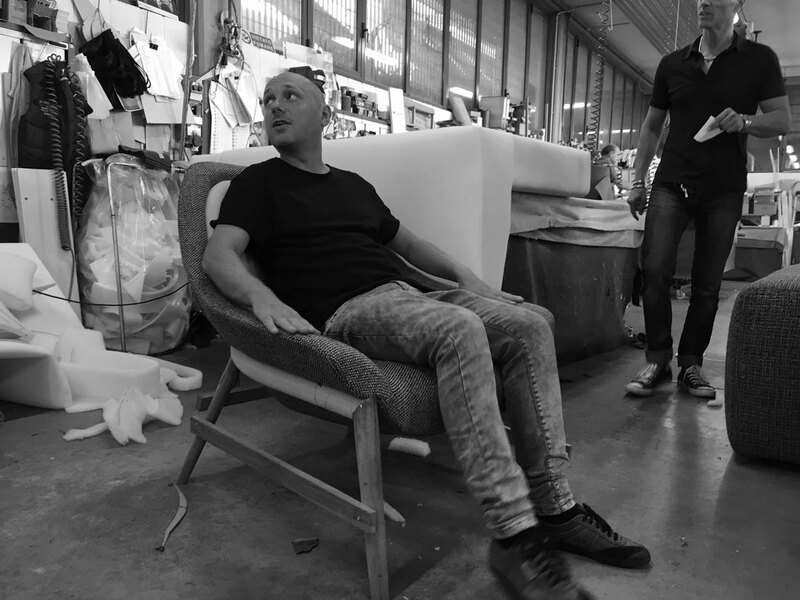 When the structure of the Hanna armchair emerged from a block of polystyrene we saw our idea materialise before our very eyes, exactly as we had envisioned it! FILIPPO BERTO: nine unforgettable months of wild prototyping. We set up a committee including Alessandro, Mari, our upholsterers, among which Flavio and my uncle Giorgio and the tailors. BERTO: What is it that drives you, motivates you and strikes you in your collaboration with us? ALESSANDRO CASTELLO: Our greatest ambition is to grow and develop, to never accept second best and to work towards our aim with hard work and passion. In just two words, ambition and enthusiasm, that which distinguishes Filippo and his team. FILIPPO BERTO: Exactly. We are constantly moved by the wish to improve ourselves, to do better than the day before. Every day is the day we start afresh. We feel fortunate for the invaluable contribution Alessandro and Mari have brought to our team. BERTO: In your opinion, what is he greatest challenge we have faced together so far? ALESSANDRO CASTELLO: Definitely the opening of the two new showrooms in Padova and Turin. In just a few months it has been a stimulating challenge which has brought, and is still bringing, excellent results and great satisfaction. FILIPPO BERTO: Facing challenge after challenge over the last few months has been difficult. Looking back they have been quite frightening. Ours has been an epic attempt which has involved us all. Working with Brianza, our territory and always growing, in our ideas, our style and the distribution. And in this case, yes, the new Berto Salotti showrooms in Turin and Padova have been the cherry on the cake. But never fear, we still have a couple of very interesting things in mind. One above all? The #BertoPrima service: the most appreciated products in our collection, designed by Alessandro Castello and Mari Lagravinese, produced to perfection and upholstered with the best fabrics and leathers and with the shortest delivery times possible. Only 48 hours in Lombardy. With #BertoPrima we have literally exploded with joy!